Spinach-scrambled eggs, toast with butter and jelly. When I was training myself to eat more veggies, eggs were a great help – onions, peppers, spinach, salsa, all great w/ eggs. So this morning, I sauteed a handful of baby spinach in a teaspoon of vegetable oil, then once it was nice and wilted, added one egg, one egg white, and a tablespoon of skim milk. In the past, I might have stopped here – but I’ve found if I don’t eat enough early in the day, I binge late in the day. So, added a pice of wheat toast, half a teaspoon of butter, and a teaspoon of jelly. All together: 277 cals. And I feel satisfied. Having some coffee for a mid-morning, my kid doesn’t take a morning nap anymore, pick-me up. Teagie is down for her nap, time for lunch and a workout. Turkey melt for Joel, garbage salad for me (meaning whatever I find in the fridge that might be good in a salad). Baby spinach, tomatoes, mozzarella, onion, crab meat, and lite thousand island dressing. Only 256 cals – but I’ll for sure need a snack later (and a drink – it is St. Patrick’s Day, my ancestors would be disappointed!). Spaghetti and lots of water for dinner – veggie enriched spaghetti (is it pasta? is it veggies? who knows!) and marinara for me, with meatballs for Joel and Teag. Note to anyone trying to cook dinner for a vegetarian in a house of meat-eaters – Italian and Mexican food are good ways to go. Made life much easier when I was a veg. But I digress…threw some onion and garlic into vegetable oil for the sauce, just to give it a little something extra. With a cup of pasta, and half a cup of sauce, plus the oil and veggies, it’s 347 cals. And I’ve burnt enough cals to have a snack later! Woohoo! 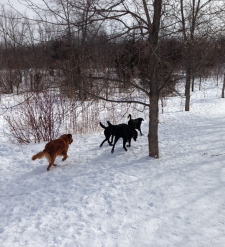 It’s been a fun day playing with my Teagie (and my pup). Now she’s in bed, and Joel and I are throwing in Homeland (just got the season 1 DVD – so pumped!). For snack: 8 oz Sav Blanc, some grapes, and two ounces of light Brie (first time trying this – I don’t recommend. I would have enjoyed one ounce of the regular kind more). I’m at or over 5 servings of fruit and veggies for the day – (1. spinach and jelly, 2 & 3. salad, 4. tomato sauce, 5. grapes) – score!! Snack is 365 cals. 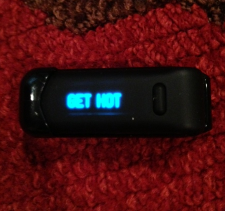 My Fitbit dashboard at the end of the day. 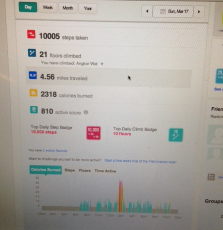 So in total for the day – 10,005 steps, 21 floors, and 2318 calories burned. I ate 1,568 cals, so that’s a nice deficit. Tomorrow will be more difficult with more stationary time at work – but I’m feeling pretty good about today!